As i see you are interested in knowing what Onam is (from me). Well, with Wikipedia around, it isn’t quiet essential for me to explain what it is and the stories behind it. But still, everyone’s perspective is quite different, so is mine. 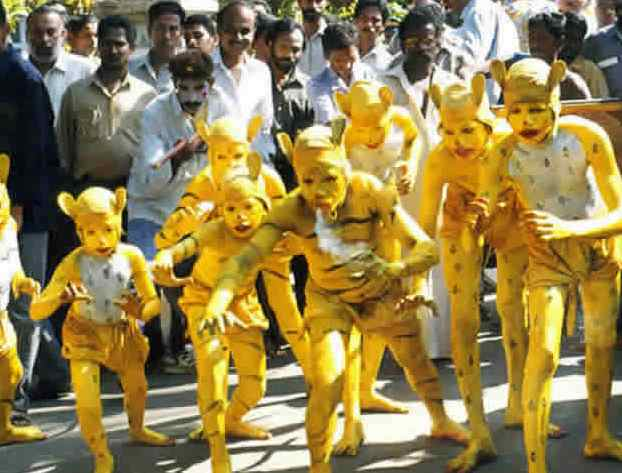 To understand Onam, you need to know Kerala. If you look into the map (googling is very easy), Kerala is like a long line slightly thickened at the centre. Even though, scientists would have a more apt reasoning, this small land is born out of the grace by Lord Parasuram (its believed that the three supreme God’s in Hinduism have assumed many ‘avatar’ to maintain the balance of world and destroy evil). Lord Parasuram is one such avatar of Lord Vishnu. Once he has finished his reasons behind the incarnation in human form, he left to far off lands to meditate. On the way, he threw his axe (his weapon) into deep sea. The region between where the axe fell and the mainland rose above sea-level and became Kerala. So it can rightfully be called “Gods own country”! Well, one day, the Gods headed by Lord-Indra (who also controls rain apart from leading other Gods) realised that Mahabali has become equally strong and might capture heaven from him. In some stories, Mahabali did defeat God’s and took over all three worlds – Heaven, Earth and Underworld.The Gods approach Lord Vishnu and he assumes his next Avatar ‘Vamana’. Vamana is a ‘Brahmin’ (upper caste) kid and approaches Mahabali. Mahabali, a warrior class and being the king, offers Vamana anything he could give him as a gift for visiting his ‘Yaga’ (prayer). Vamana asks for three foot of space to pray, which Mahabali obliged to. Apparently, Mahabali’s teacher identifies Lord Vishnu and asks Mahabali to back off from his word. Here comes the best, Mahabali asked for his teachers forgiveness as he could never break his word to Vamana and thereby his honour. His teacher cursed him. Yet Mahabali turned and asked Vamana to go ahead and occupy ‘three foot’ space anywhere in his kingdom (the three worlds). Vamana grew into huge human being, stepped on earth and heaven in his first two steps and asked Mahabali, where next? The king removed his throne and kneeled before Lord Vamana and asked him to rest His foot on his head. Vamana didn’t hesitate, and pushed Mahabali into the underworld, where he rules today. The scriptures also says that he is destined to be the next Indra to rule the heaven and will rule underworld (hell) till then. But being such a great king, honest and brave, Lord Vishnu granted him a visit every year to his old kingdom. It is the harvest season during August – September. Onam is the festival welcoming him back! I know it is a very fascinating story but for me its like Chanakya’s Arthashastra. It has so many meanings and sense. Honesty and Courage is rewarded, always. Three Gods is a standard principle in almost all religions. Story telling was the art used to pass wisdom (my inference). Every harvest has a festival and a divine story behind it. There is a stability factor which has to be maintained between good and evil. Sura with negative thoughts is Asura and vice versa. This is the celebration of hope, towards prosperity and peace. I can go on, but these are for you to understand, i find mythology as accumulated wisdom for success. Onam used to be celebrated for more than few weeks till a ruling by a King, when i got reduced to 10 days. (though nowadays people celebrate it for almost 3 days). It is when families gather together and celebrate. It has fascinating story telling dance forms along with sumptuous feasts. An art form, few centuries old, depicts tiger hunting without hurting the tigers. Pookalam – these art-forms are the centre piece of Onam. They tell stories and welcomes Mahabali. 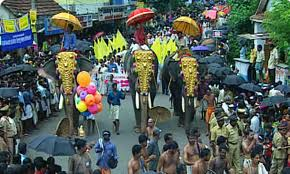 The elephant procession to temples. Festival begins. 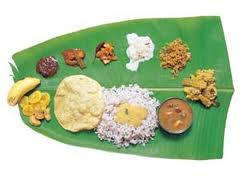 My favourite part – the sumptuous meal on a banana leaf with all your family members. Ah, the bonding from that lunch lasted for a year till we refreshed it next yr.